For Minecraft players looking to add excitement to their multi-player gaming or realism to their military-oriented designs, Flan's Mod adapts the standard Minecraft building tools to allow players to create planes, vehicles and weapons within the game. 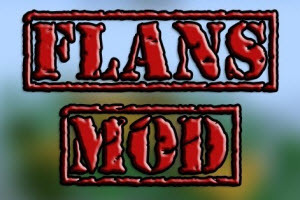 The mod itself does not install additional items, but it is designed to permit users to easily create packs of custom content that can be built by players after it is added on top of Flan's Mod. With these and any of the easily-available vehicle custom content packs, you can begin crafting vehicles and planes that you can use to navigate the landscape with ease. Flan’s Mod has its own vehicle controls that will be the same for every car or plane you build, even if the content pack was created by a user other than Flan. Many of the content packs available are weapon packs with various themes. Even the original packs made by Flan have a huge range of options in style and effect, from the realistic World War II pack to a modern weaponry pack for fierce multi-player battles to a completely harmless Nerf weapon pack; many more user-created packs of weapons are available as well. Most weapons are designed to be carried by the player and used with predictable effects: They can kill animals or players, and the more powerful weapons will also destroy blocks with impressive explosions.